There has been a lot of news reports, documentaries, and discussion recently about the dangers of solar activity and its solar maximum expected in December 2012, a date tied to ancient prophecy in many cultures and visions of cataclysmic proportions. SuperConsciousness had the opportunity to speak to one of the expert solar physicists from NASA who is currently involved in the latest cutting-edge missions exploring and closely studying the sun and its particularly intense and unpredictable active cycle. In this exclusive interview, solar astrophysicist C. Alex Young, PhD, creator of TheSunToday.org, and a member of NASA’s STEREO, SOHO, and HINODE missions, guides us through understanding the science and dangers of solar flares, CMEs, solar radiation, and geomagnetic storms. What do they all mean, and do they imply a greater impact on our planet than just merely stunning swirls of color lighting up the skies? As an expert scientist on the topic, C. Alex Young, PhD, helps us shed a ray of light and knowledge on many current dark fears about the sun’s potential impact on our planet, way of life, and future. SC: Can you tell us which level solar flare or CME would be a real danger to us, the one that the electrical companies would be concerned about and NASA would be powering down their spacecraft? AY: There is a relationship between how big a flare is and how big the CME. They can occur together, but they can also occur separately. You can have CMEs that don’t have flares and big flares that don’t have a CME. But generally, when you have the largest of the flares and the largest of the CMEs, they happen together. Now as far as being concerned, in terms of power grids and satellites, it’s not the flare we have to worry about, really; it’s the CME. The flare can cause disruptions in communications eight minutes after it occurs. Basically, when we see it, you know we can have blackouts in communications. But those usually only last on the order of an hour to several hours. So that’s not something we can necessarily prepare for. We can proactively realize that this can happen and have redundant communication systems and things like that. But as far as the scale of events, seeing the size of the flare is a good indication. We have this scale of flares where we measure a flare’s size by how much X-rays it puts out. We have satellites that are run by NOAA (National Oceanic and Atmospheric Administration), called the GOES satellites (Geostationary Operational Environmental Satellite). They’re geostationary satellites and they have X-ray monitors. The level of X-rays that they measure is what we use to determine how big a flare is. There is a relationship between how big a flare is and how big the CME. They can occur together, but they can also occur separately. The scale starts with the A flares. Then the next one is a B flare, which is ten times an A flare. Then there’s a C, which is ten times a B flare. Then there’s an M, which is ten times a C flare, and an X flare, which is ten times an M flare. So we have a scale of A, B, C, M, and X. Then we put a number on the front of it. So we could say it’s a C-4 flare. That is four times the level of a C-1 flare. Basically, you have a measure of how intense a flare is — that’s your basic measure — and then you go up in powers of ten. So that’s the scale. We really start to be concerned about flares when they reach the X level. SC: How strong was the solar flare that caused the blackout in Quebec in 1989? AY: The one in ’89 was one of the largest flares that we have seen in modern times. It was an X-20. It was actually 20 times an X-1 flare. Again, really, what was the concern was the CME. So when you see the large X flare, the first thing you want to ask is, does it have a CME associated with it. If you see it, there’s a good chance it does. When you see the CME, what we do now, with a combination of STEREO and SOHO, is we want to measure the speed or the velocity of the CME. We want to know what direction it’s going and what’s the speed it has. Speed and direction together are velocity. When CMEs start to reach a speed of 500 to 1000 or more kilometers per second, that’s when we start to be concerned if they’re traveling in the direction of Earth. There are a couple of things that we have to keep an eye on. We keep an eye on the level of the X flare, so we generally pay attention when it’s an X-1 or above. And the reason is because at about the X-1 level flare, you start to see radio blackouts of about an hour. The side of the Earth that’s facing the sun when the flare occurs, it ionizes, it heats up that outer atmosphere on the day side of the Earth, and that’s where you’ll have these radio blackouts. In that case, how do you prepare? Well, let’s say, communications are very important when you’re doing something at this particular time. If you get an alert that there’s a really high probability of an X class flare, then you need to make sure that if you’re doing something that’s depending greatly on communications you have a backup plan or you have an alternative communications source, something like that. Giant Filament!! 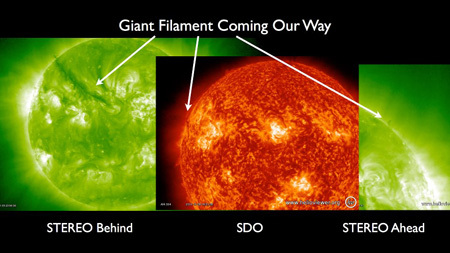 There is a giant filament just about to rotate onto the side of the Sun facing Earth. (A filament is dark cool material 40,000 to 60,000 Kelvin compared to the million+ Kelvin corona). The filament is close to 1/3 the distance around the Sun in length, +1,000,000 km or +80 Earths back-to-back. Here is a composite image showing the filament from STEREO Behind, which shows much of the Sun we can’t see yet along with the Sun seen by SDO and the other side from STEREO Behind seen by STEREO Ahead. The filament is starting to become visible with SDO and one tip of it is visible with STEREO Ahead. If it erupts once it is facing us it could give us a good sized CME and lots of aurora but we will have to wait and see. SC: What about airplanes? I mean, no one is talking about airplanes. They say that my cell phone is not going to work. But how are airplane’s navigation systems affected by this? AY: That’s a very good question, because it is important to airlines. In particular, it’s important for aircraft that have polar routes. Let’s say you’re traveling from Washington, DC to Tokyo, Japan. The most common route, the shortest route, is to actually fly close to the pole. To fly over the poles like this, instead of around the globe, is the problem. There are rules about how long they must always be in radio contact. They have to be in contact all the time. And there are different ways to do communication. But when you’re in the pole, you have a much higher chance during a strong flare and CME of this communication being disrupted up there. What would happen is the airline would change their route from being a polar route to around the Earth. They don’t want to do that if they don’t have to because that requires a lot more fuel, and so it’s a lot more expensive. But airlines do pay attention and they do watch this. Now as far as being concerned, in terms of power grids and satellites, it’s not the flare we have to worry about, really; it’s the CME. The other thing that’s of concern to airlines, and not really a concern to airline passengers, unless, say, you fly to Japan every day. Is a lot of high energy particles. As I mentioned, the magnetic field is weakest at the poles, North and South. That’s where high energy particles have the easiest time escaping into the upper atmosphere and if you are an airline pilot or a flight attendant and you’re in the air all the time, you may be exposed to higher amounts of radiation. That higher amount of radiation does not happen at one time, but over a long period of time. It’s very important that if you’re in an environment, let’s say you are an X-ray technician, you have to make sure that you’re not exposed over a long period of time to more radiation because it does add up. If you were flying in airplanes a lot over the poles, in a period of solar activity, you may be experiencing an increased amount of radiation. Over a long period of time, that builds up. They want to know about that and make sure that people are not exposed to more radiation than they normally should be. SC: Is there a scenario where a solar flare that only takes 8 minutes to get to us, a very intense one like the X-22 that hit Quebec or something in that vicinity, could disrupt the electronics on an airplane, is that a possibility at all? AY: It can disrupt communications. The way it disrupts communications is it disrupts the way the radio waves travel. So in that sense, it’s not disrupting the equipment, but it’s disrupting the path that the radio waves take. However, if there is a very large flare, there can be a large particle storm associated with it. Now the particle storm — these are ultra-relativistic particles, very close to the speed of light but not the speed of light — they travel to the Earth, but they take a little bit longer, more like 20 minutes. I think in general the chances of them affecting electronics are very slim, but it’s not impossible. It’s not inconceivable that you could have some effects to that. For the most part, it’s not really an issue because, still, we are protected by atmosphere, even when we’re up in an airplane. The atmosphere still helps a lot because most of the particles that we’re concerned about are the ones that come from the CME and are related to that. I don’t know exactly what the effects would be, but it’s probably best to say that there is a possibility that they could have some impact, but I think it’s minimal. SC: Back in August and September 2011, we were hit by several CMEs at the same time. At one point it was two, and then later it was three hitting the Earth at the same time. Everybody is excited that we get beautiful aurora pictures as a result. But is that increasing the particle storms penetrating the Earth’s atmosphere? AY: Absolutely, it is. Because a couple things happened. In terms of the geomagnetic storm, the magnetosphere is disturbed and then it gets hit again. It doesn’t have time to settle down. So that can increase both the intensity and also make the storm last longer. You would have an aurora for a lot longer, but you could also have the effects. Now, there is another thing that’s interesting about this. The largest solar storm that we know of happened in 1859. We didn’t have spacecraft then, so we couldn’t measure the size of the flare. But we have a lot of indirect evidence. We have magnetometers, things on the ground that measure fluctuations in the Earth’s magnetic field. We have stories about the intensity of the aurora that happened then, an aurora which was seen down close to the equator. As an aurora gets stronger, you see it farther, farther, in lower latitudes, magnetic latitudes, farther south in the Northern Hemisphere, and farther north in the Southern Hemisphere. If you were flying in airplanes a lot over the poles, in a period of solar activity, you may be experiencing an increased amount of radiation. Over a long period of time, that builds up. That particular storm is sort of considered the perfect storm because what happened was an incredibly powerful CME that erupted from the sun and that CME kind of swept the way. Not only did it impact the Earth but it also cleared the path, and then there was an even larger CME after that which was even less impeded. So that just amplified the impact. Having multiple CMEs together can increase the intensity and the duration of a geomagnetic storm. This particular event that happened in 1859, the exact size of it is not really known but it’s considered on scales of 10s to 100s of times bigger than anything we’ve experienced. It was much like when people talk about floods in terms of a 100-year or 1000-year flood records. This was an event like that. Overall, it was estimated to be probably the largest solar event in the last 5000 years. The way that was measured was based on some other indirect measures like ice cores. You can measure the amount of particles that are hitting the upper atmosphere by looking at nitrogen in ice cores, which is created when these particles hit the atmosphere or I think it’s nitric oxide. I’m not quite sure. But you can see that in ice cores and you could also see it in volcanoes and things like that. You could see large particle events and the one in 1859, as far as we can tell, was the largest event at least in the last 5000, possibly the last 10,000 years. SC: What was the highest solar event that you have recorded? AY: The largest flare that was recorded, actually, interestingly enough, was exactly eight years ago today, November 4, 2003. That was the largest solar flare recorded. You may have heard of a period of time called the Halloween Storms? Back in 2003, in late October, beginning of November, there were several active regions, sunspot groups with magnetic fields, very intense, that travelled across and rotated across the surface of the sun. And over the entire period that active region was visible, it sent off CME after CME, flare after flare, particles, you could see lots of them. And so we had two of the largest flares ever. On almost the last day of that period, just as that active region was about out of view, when it was on the edge of the sun, November 4, at 19:29 universal time — which was about two hours ago from now, eight years ago — it produced a flare which was so intense that the GOES spacecraft could not measure how bright it was. It was actually off the scale. The detectors on the spacecraft were, what we call, saturated. They were overwhelmed by the number of X-rays. So we did estimations. At the time, I was actually here at NASA and I did an estimation myself. I came up with an estimate of X-40. And then officially, some more sophisticated analysis was done and I think the final estimate was that it was at least an X-42. So that is 42,000 times an A flare. 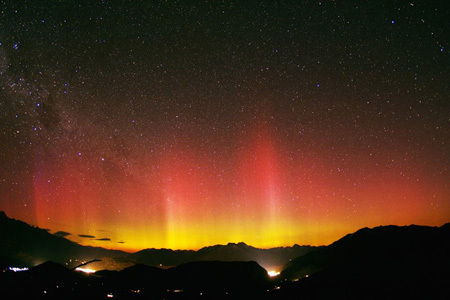 Halloween Aurora: Earth’s magnetosphere, was brushed by a solar wind stream Oct. 30-31. Creating aurora. 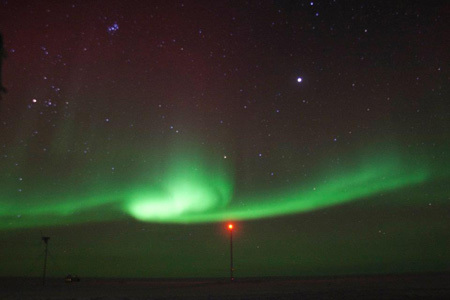 These photos were taken by Christina Hammock at a climate research station in Greenland. SC: I do not recall hearing any reports at the time that this flare knocked out the power grid around the world or made airplanes crash down. What really happened? AY: Well, no, during that period called the Halloween Storms, there was a lot of geomagnetic activity. There were a great number of aurora, there were some satellites which were damaged. There were some power grids which were affected around the world. We did not have the scale of power outage that they had in Quebec in 1989, but we did have some in various places around the world. There were very large particle storms. We did see a lot of substantial space weather effects. But the good side was that there was nothing catastrophic, nothing at that level, even though that was an extremely, extremely active period of almost two weeks of high activity, some of the highest activity we’ve ever seen. Having multiple CMEs together can increase the intensity and the duration of a geomagnetic storm. SC: Can you tell us what the Kp Index means and what level it reached during the Halloween Storms? AY: The Kp was off the scale. It’s only usually measured up to nine and it was well above nine. The Kp is a measure roughly of how much the magnetic field is disturbed, how much it fluctuates. I believe there’s another index called Dst (disturbance – storm time) which is a measurement of the disturbance of the magnetic field. And I think the Dst was about -200, and that was larger than any that had ever been seen before. I mean, probably the biggest storms we’ve seen over the past couple of years, not that we’ve had a lot, but the Dst has been about -100 or -80. So this was a really high one. It was quite a lot of disturbance in the magnetic field of the Earth. SC: How do you protect your sensors out there in space with the STEREO mission? Are Faraday cages effective to protect our electronics from an extreme solar event like the ones you have described? Can you tell us a little about Faraday cages and how you actually shield your mission’s sensors in space where they’re so close to direct impact from the sun? AY: There are a couple of things. In our missions to space, all of the electronics and all the hardware is what’s called radiation-hard. Whenever new electronics are made, new computer chips, they are developed and tested in high radiation environments here on Earth. They are put in front of accelerators or intense radiation sources. They’re tested so that they’re not affected by these single event upsets. But that stuff is put in space and it is much different than what we use here on the ground. A lot of the hardware is protected because it’s made radiation-hard. The other thing we have to do is we sometimes have to put a spacecraft into a safe mode. We power them down. For example, if you look at a video I posted today on my Facebook page from the October Halloween storm, I showed the whole period observed with the EIT instrument on SOHO, which is the EUV imager. When these particles, these fairly intense particle storms hit it, you can see that the images basically get all washed out. There’s snow, you can’t see anything. So when they are more intense, you can’t really use the cameras. So we put them sometimes into safe modes. But they do experience damage and there’s not a whole lot we can do about it. We can make instruments which can handle a lot of damage, but their lifetime can be reduced. The solar panels on SOHO were degraded by a very famous particle event that happened July 14, 2000. It was called the Bastille Day Flare. And that particular flare produced a huge particle storm which impacted the spacecraft. And all of the cameras were basically useless and the solar panels were degraded by it. Their efficiency went down. There’s not a whole lot you can do other than make equipment that can handle high radiation environments. When storms come, you turn equipment off because if electronics are off, then they’re not going to be affected very much by this sort of thing. We don’t really have Faraday cages necessarily. I mean those are not really going to help you very much up there. Cell phones go out not because the cell phone got fried. When we have solar storms, cell phones may go out not because of the hardware, but because of the communication, the radio waves not being able to travel as well. If you turn your cell phone off, there’s nothing going to happen to it during a solar storm. It’s not going to be affected. Particle storms are only going to cause a problem when the electronics are on. It could cause a problem in, say, the flash memory. It could corrupt solid-state hard drives, for example. It could maybe disrupt or corrupt your data, but basically when your equipment is off, it’s not really going to be affected. SC: Another thing that brings up some concern are the polar ice caps, especially when you mention that the poles are the weakest points, and that they receive more of the charged particles coming in. Are you aware of any studies monitoring the ice caps on the poles? Are they melting or being affected by the solar activity? What’s happening there? AY: As far as I know, there’s really no evidence that shows it’s causing any change in the melting or temperature. Because these particle storms and because of being close to the poles, that’s where we can measure long term solar activity, looking at ice core samples. What’s happening in the atmosphere because of these solar storms is recorded in ice over a long period of time. But as far as I know, there’s really no concern in terms of solar activity affecting ice cores or anything like that. None of these sorts of particles would change it. Plus, the other thing to remember is that even though you see more aurora at the poles, when you are on the surface, when you are standing on the ice, you are still sitting under many miles of atmosphere. Even though the magnetic fields are weaker, you are still protected a great deal by the magnetic field. SC: The interview that you posted on your homepage with WJZ Baltimore TV, sometime back in June, mentions a heat wave going on at the time. The reporter prefaces the whole interview with, “We’re in the middle of a heat wave, but it has nothing to do with the sun.” And then he goes on to ask you about the sun activity. Are you aware of other scientists following some worthy data out there connecting the solar activity with climate change and the weather? AY: This is an active area of research. I have a colleague, Dr. Phil Chamberlain, who is one of the principle investigators of the EVE (Extreme Ultraviolet Variability Experiment) instrument, which is on the SDO spacecraft. The EVE instrument studies the total solar radiant, what is the total energy that comes from the sun that the Earth receives. Because that has implications for weather and climate, part of what they want to study is does the change in activity over the solar cycle, and even individual events like flares, have any sort of impact on the upper atmosphere or, specifically, on climate and weather. This is a bit out of my field. I’ve read papers on it and I have a basic understanding of a lot of the physics, so I can make sense of them. Though there are areas of research that still need to be explored. My overall feeling is, at least with what we know now, that there really is no strong influence of solar activity on climate and weather. If there is a lot of activity from the sun right now, we’re not going to see it in terms of our overall weather and climate. There may be more subtle change over a long period of time. There may be very, very, small amount of change associated with solar activity which you could measure over a long period of time. But I don’t believe that there are any large effects or even really any direct effect. SC: Could intensified solar activity have any effect at all on the gravitational pull of the Earth and possibly disrupt tectonic stability indirectly? AY: No, because they’re very different forces and we — some of us — have studied it. I have a colleague who has actually looked into it a little bit in relation to things like earthquakes. Some people like to claim that earthquakes and solar flares are related, and most people in my field have long said that there is no relationship. People have looked at correlations. This is something that came up a lot on my Facebook page, so what my colleague Ryan did is he went and grabbed data from the USGS, the Geological Survey, and solar flare data, and plotted them together to look at them. And looking at them together without even doing any sophisticated statistical analysis, it’s very clear that there’s absolutely no correlation between solar flare activity and earthquake activity. Then, on top of that, one of the things that people often really have a hard time with is understanding the difference between correlation and causation. There are a lot of things that are correlated, but they may be correlated with other things indirectly. Just because one thing is correlated with something else does not mean that that one thing caused it. But understanding the basic physical mechanisms, there’s no reason to believe that magnetic activity, solar flares, impacting the atmosphere would have any sort of effect on the Earth. And we’ve looked at it, and in all of our looking and even more detailed looking from other scientists, really showed there’s no relationship. SC: I was really interested to read about all the different speaking engagements you’ve been involved in and the list of topics that you could speak on. Number one on the list is “the sun”, next, “solar activity, solar storm, space weather, solar image processing”, and at the end of the list you have “2012 and the sun”. I saw that you were part of the Discovery Channel special, The Apocalypse 2012, that aired back in November 2009. But you kind of ruined the party in a way earlier when you told us that the solar maximum is not on 2012, but somewhere in late 2013 or 2014? What’s the worst scenario you foresee could happen for 2012 and beyond with what you know? They studied that potentially it could knock out large-scale power grids and power structures, which could cause power outages that could last for weeks to even months. That would be quite bad. If large areas of the country had power outages for weeks or months, you would have spoiling food and medicine. A lot of things would be in chaos. They estimated it would cause damage in the order of trillions of dollars. But that is the absolute worst case scenario and I think they made some assumptions about not being prepared for it and the power companies not expecting it. I think there are still plenty of things that can be done to improve our power grids. 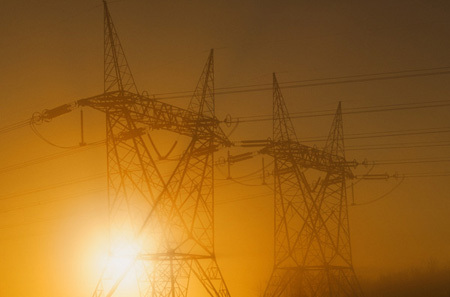 There are a lot of things in our power grids that are very old and need to be improved. A lot of our infrastructure can be improved. However, I think that that is still a very highly unlikely scenario. Without even doing any sophisticated statistical analysis, it’s very clear that there’s absolutely no correlation between solar flare activity and earthquake activity. One of the things that comes up in the 2012 discussions and in terms of solar flares is, “Could a solar flare be strong enough that it could, say, vaporize the Earth or be strong enough to blow away the atmosphere?” The physical mechanism exists. We do know a solar flare has a direct effect on the atmosphere and if something was strong enough it could do that. However, what we do know, and I’ve done some calculations myself, is that the sun is physically not capable of producing a solar flare of that amount of energy. That would require more energy coming out of the sun than it’s simply able to produce. The only thing that could do anything remotely like that would be a supernova explosion. And that’s an entire star exploding. First of all, that’s not going to happen because our star is not large enough. 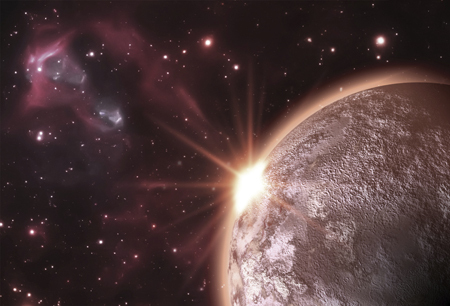 Second, our star still has five plus billion years of life left in it. So the idea of a solar flare destroying our atmosphere or solar flare annihilating the Earth, I think that this scenario comes up in the movie called The Knowing. It’s simply not physically possible. It’s not going to happen, and I can say that with complete certainty. You know, there are a lot of things in my field that are not necessarily certain, but the sun is not capable of producing a flare like that. Yes, we could have some fairly large solar events that could cause a lot of damage. It’s possible that we could see some large portions of power grids around the world affected. I think having anything on the scale of what was described in this report is very, very unlikely. The improvements that have been made both in our understanding of the effects and being able to monitor them with the fleet of spacecraft that we have now has vastly improved, even over the last five years. So as I mentioned before, it’s something that we really need to be aware of, that we need to be diligent and proactive in, but the idea of anything destroying our civilization, so catastrophic as to wipe out all life, these sort of scenarios are just not possible. It’s not something to worry about. There are all sorts of ways in which the world is supposed to be destroyed during some sort of catastrophe in 2012. There’s asteroids and earthquakes and all sort of stuff. As far as solar activity, it’s not going to happen. I said that at the end of the Nova documentary, too. It’s just not really a plausible thing. I think it’s an important field for people to understand. I think we are living in a really amazing time with a combination of incredible instrumentation that shows us the sun in amazing detail. We have social media and internet access that allows people to see all of this activity, see what’s going on with the sun, and be excited and care about it in a way that we didn’t have five, ten years ago. I think all of these things together are really, really amazing. I think we do live in a pretty amazing time in terms of understanding the sun and understanding how it affects us on Earth. The sun is very important. It gives us heat, gives us light, but it does affect our technology. And if we’re going to continue to become more and more sophisticated, we have to counter that by being able to be prepared for solar activity. Then, on top of that, one of the things that people often really have a hard time with is understanding the difference between correlation and causation. SC: Are there certain regions of the Earth that are more susceptible to solar storms? Can the impact of a solar flare, CME, or particle storm be localized to a certain degree or is it spread evenly around the entire planet? AY: In terms of solar flares, the area that’s going to be affected communication-wise is the area that is facing the sun, daylight. As far as solar storms, when the magnetic fields come out in loops, and a storm is strong, it pushes in, which allows the activity, the currents and the particles to get farther down either in the Northern Hemisphere and farther up in the Southern Hemisphere. Because of the structure of the magnetic field, people closer to the poles will be more affected. That’s why we see more of these power outages happening in Canada or Norway, and there have been reports of this happening in the past in South Africa. So higher latitudes are more susceptible. Being near the equator you are less likely to experience these sorts of problems. But as the storm is stronger, the effects can go farther. In general, being closer to the poles, within 10 to 40 degrees latitude, can make you more susceptible. SC: Is the case reversed in terms of solar radiation? If you go to the beach near the equator, to the Caribbean, you need stronger skin protection from the sun, correct? AY: That’s true. But again, the radiation, the general output of the sun, which is the type of radiation that affects us in terms of giving us heat and producing sunburn, does not vary a lot over the solar cycle. Solar activity has very little effect on that. But the kind of radiation that’s dangerous that comes from solar flares, the X-rays and the Extreme Ultraviolet, we’re still protected from that by the atmosphere. Even at the equator, versus being at the North and South Pole, there’s still so much atmosphere that’s above us that there’s little if any difference. It just doesn’t make it through the atmosphere at any level. SC: Are there any other sun cycles that you guys are studying or beginning to become aware of, apart from the current solar activity? AY: There is a 22-year cycle, which is related to the 11-year cycle. The 22-year cycle is the polarity of the sun’s magnetic field, the north and south, that changes over a 22-year cycle. But the activity happens over these 11-year cycles, so the two are related. There are people who do study longer term cycles and are looking for longer term cycles from the sun or shorter cycles. I don’t work in that particular area, but there are people who study that and some people are looking at long-term measures of solar activity and solar output through things like ice core data and things of that nature. There are also people who looked at shorter time scales with data from helioseismology instruments that look for other types of cycles and patterns. I don’t know of any definitive ones besides those main ones. The sun itself actually oscillates, which is why we use helioseismology. But in terms of a general cycle of activity, really the main one is just that 11-year cycle. Yes, we could have some fairly large solar events that could cause a lot of damage. It’s possible that we could see some large portions of power grids around the world affected. We do monitor the solar storms that travel away from the Earth. For example, the one that happened yesterday on the backside of the sun that actually is going to propagate past Venus and it’s going to propagate past the STEREO-B satellite, as a matter of fact. We do study that, not only because in the future we have manned space flights which may go to Mars or other planets, or even spacecraft that are going to other planets, but because they can be affected by space weather, too. We have seen effects. We’ve seen effects of large solar activity on the atmosphere of Mars. We’ve seen the effect of solar activity on some of the exploring missions on Mars. Solar activity is still studied throughout the solar system and having something like the STEREO has been very beneficial not only for us seeing it on Earth, but also understanding how it’s going to propagate through the rest of the solar system. SC: Alex, we want to thank you very much for your passion for the sun and for sharing your knowledge with the public. We are very much appreciative of your work. Is there anything else you would like to add to this interview? AY: I can’t think of anything other than I hope that your readers explore a little more about the sun. There’s a huge rich set of data from the sun and there’s a lot of new and exciting places to find it. One of the reasons that I have my site — thesuntoday.org — is for people to be able to find places, other websites with information on the sun. I hope that people will spend some time exploring it, looking at the videos, getting a feel for the kinds of things the sun can do, and hope everyone enjoys it. It’s a pretty exciting field.